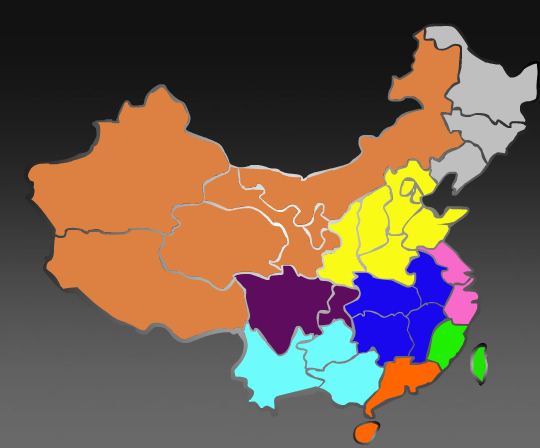 Home » Writings » History » Chinese History » Nine nations or nine macroregions? Nine nations or nine macroregions? There’s a map, first posted by the Atlantic Monthly this week, that’s been making the rounds. This interactive map, credited to Beijing-based academic Patrick Chovanec, explores China’s diversity by dividing the PRC into discrete “nations.” It’s an interesting project, especially because it shows how different regions have their own internal socioeconomic logic and that “China” as presently constructed, is very much just that…a construct of multiple cultural, linguistic, economic, and ethnic zones. In fact, the project is so interesting it’s been done before. While Skinner’s research is a bit wonkish for non-specialists, anyone who has done graduate level studies in a China-related field has come across Skinner and his macroregions at some point. In The City in Late Imperial China (1977) Skinner argued that China could be understood as a set of nine macroregions: physiographically discrete regions with a distinct core and periphery wherein, in historical China, the majority of trade consisted of goods shipped between internal markets rather than sent out to other parts of the empire. Professor Skinner and his team would later create a similar model using data sets from contemporary China, the results of which include the map shown above. While his original research looked at marketing systems, Skinner’s work literally redrew the map in terms of how researchers looked at different geographic zones. Administrative distinctions, provinces and the like, began to seem like artificial and flawed ways of spatializing research and data. If anything, the differences between the two maps are due to Skinner’s more sophisticated analysis which, unlike Mr. Chovanec’s map, for the most part ignores provincial boundaries. Originality aside, the basic idea behind both maps is an important one to bear in mind when looking at China. We tend to fixate on political boundaries, even when those boundaries and borders are drawn more for administrative convenience or for other, even more arbitrary, reasons. (Who can forget the story of Winston’s hiccup? One of the all time great “If it’s not true, it should be” historical anecdotes.) The size of China’s national borders can obscure an incredibly complex and diverse set of economic, cultural, and social distinction and it’s a perception I try to shake a bit in my classes. For that matter any map, even one with as rigorous a set of data and analysis as Professor Skinner’s, is simply another way to artificially divide space to aid our understanding of that space and, as such, the means by which the lines are drawn are always open to scrutiny and debate.